At Tri-State Business Systems we provide cutting edge technologies and barcode supplies like barcode labels, thermal ribbons, software, printers, and wireless scanners at great low prices. We specialize in Zebra labels and are an authorized Zebra certified reseller. Zebra brand barcode supplies like printer labels, printers, ribbons, and other barcode supplies represent some of the highest quality products and leading technologies for barcodes in the industry. 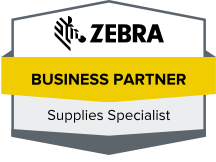 Tri-State Business System’s extensive knowledge of Zebra barcode labels mean we can get you a full audit on your needs, as well as a complete installation in under a week, all at a great price. We have efficient shipping methods that allowing you to restock materials with less hassle. If you ever need maintenance or repair, we offer complete services unlike many other barcode distributors who will sell you a system and you will never hear from them again. Our customer support is on standby 24/7 to ensure that we are ready to assist with any technical difficulties when they happen and resolve them as quickly as possible. We work with many businesses who need barcode tracking solutions, by providing Zebra labels, ribbons, and other barcode label printing supplies at prices that fit your businesses needs. We carry all of the most popular brands so you can be sure to find the products your business prefers, like TSBS, Zebra, Sony, and Datamax. We offer Zebra barcode labels and systems that can be customized so you only buy what you need with no parts left over. Contact us if you need card printers, kiosk printers, mobile printers, and more that can be designed for both retail and industrial applications contact us today to place your order or learn more information about the Zebra labels to best suit your needs.